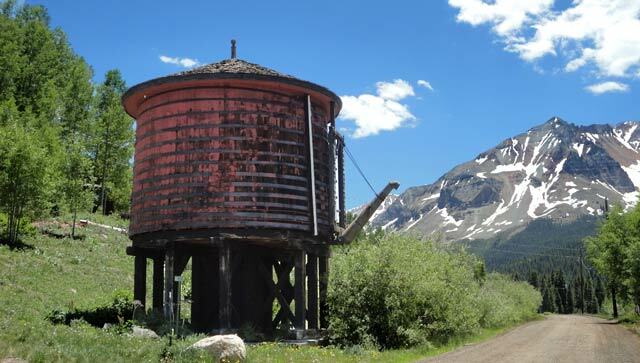 Old RGS water tank along the Galloping Goose Trail. This is located at approximately Point B on the GPS map. The Galloping Goose was a famous part of the Rio Grand Southern Railroad. RGS connected Ridgway with Telluride and, via Lizard Head Pass, down to Rico and around finally to Durango. 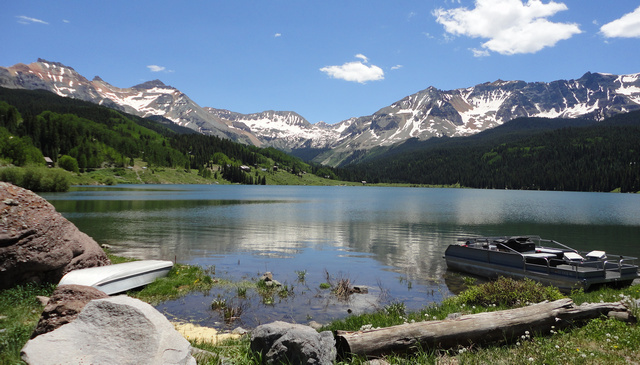 The railroad went through some of the most spectacular scenery in the Rockies, including Dallas Divide, Telluride, around Trout Lake, over Lizard Head Pass, and on. When mining wound down around here, the line suffered. Rather than send a full train, engine and all, when the passenger load was light, they created the Galloping Goose, made of an old Packard plus a passenger compartment that ran on the rails. Several of the GGs still survive, including at the Ridgway Railroad Museum (click here to see their Galloping Goose page). Strictly speaking the Galloping Goose Trail is actually simply the old roadbed for the RGS from a point by the Forest Service Matterhorn Campground up to Lizard Head Pass. It’s now San Miguel County Roads 64B and 63A and is easily traversed in any vehicle (I did it on the motorcycle). I’ll lead here with the GPS map as it shows where the photographs were taken. 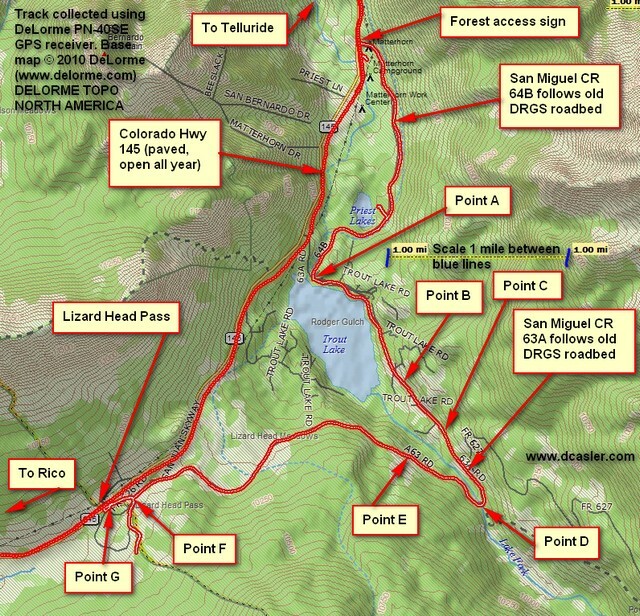 On July 1st, 2011, I accessed the trail from the north, near the Matterhorn Campground. 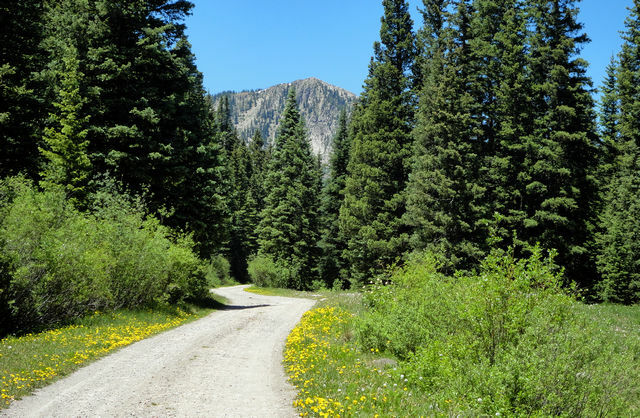 The highway department had recently put up a sign saying that there was forest access via the campground. The campground host set me straight—they’d put the sign in the wrong place. So I backtracked a hundred yards or so to San Miguel CR 64B. It’s called Priest Lake Road because it goes by Priest Lake, a rather disappointing holding pond that doesn’t rate a photograph here (you can see my detour to see the lake, and it’s lake, not lakes). The road follows a very gentle incline because the railroad engines couldn’t climb really steep grades. 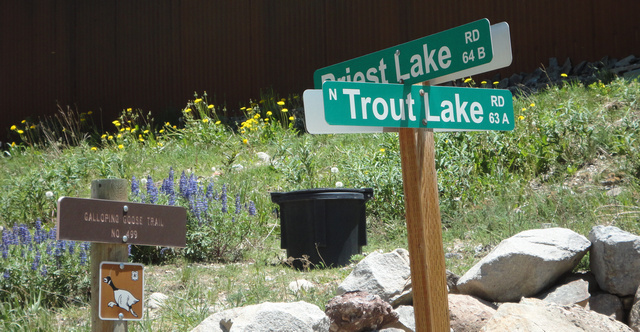 Priest Lake Road ends at Trout Lake Road, San Miguel County 63A. The photograph below was taken at Point A. This sign marks the intersection of Priest Lake Road and Trout Lake Road. From here head north if you want to travel toward Telluride. Go east if you wish to travel to Lizard Head Pass. Looking south from the intersection, you see this sign pointing east. This marks the direction of the old roadbed for the RGS. Not far from Point A I took the following picture of Trout Lake. You can see what I mean by spectacular scenery. There are a couple interesting leftovers from the railroad days. The first is the water tower that you see at the top of this post. The old steam locomotives did not recycle the water they used, so fresh water had to be available in large quantities every so often along the track. As you travel further, you’ll see the road sign for San Miguel CR 63A at about Point C on the map, noting that there’s no winter maintenance beyond this point. If you see this sign, you’re on the right track, so to speak. The next photo is taken at Point D, and is the old railroad trestle over the creek. There are fences at each end to keep people off as the trestle isn’t maintained and is quite dangerous to attempt to climb or cross. But it is photogenic. This picture, taken at Point E, shows the gentle grade and scenery along the Galloping Goose Trail. The picture looks west. 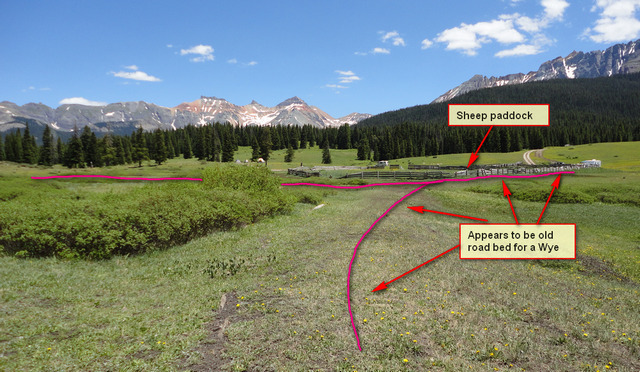 When you get up to the giant meadow at Lizard Head Pass, the road ends abruptly. This sign directs traffic from there back down the road and is taken at Point F.
Galloping Goose Trail Sign atop Lizard Head Pass, directing those interested back toward Trout Lake along San Miguel CR 63A. Note: I can't correlate the "Trail No. 499" with anything. Perhaps it's a Forest Service designation. That’s the end of the trail. That doesn’t mean it’s the end of the road bed. Traffic is blocked from following the old right of way any further south. But that didn’t stop me from taking a good look. The remainder of the pictures were taken from Point G. The first looks back to the north and shows where the grade came through and the flowers that now cover the old road bed. The RGS roadbed going south from Point G, over the pass and down toward Rico. It’s apparent there was a wye atop the pass. This last photo looks east from Point G and shows where the old wye track was laid. It goes right next to the still-standing sheep paddock. The wye allowed trains to turn around and go the other direction, also the spur off the wye permitted loading those sheep onto the train. This entry was posted in GPS Tracks, Motorcycling, San Miguel County and tagged galloping goose trail, lizard head pass, priest lake, trout lake. Bookmark the permalink. As a Board member of the Ridgway Railroad Museum, I invite you to stop in and research the “Galloping Goose”. Your history is a little fuzzy. Instead of creating “the Galloping Goose, made of an old Packard plus a passenger compartment that ran on the rails.”, the RGS actually built seven railcars or “Motors” as mail and freight haulers starting in 1931. The first two were built from Buick automobiles, and 3, 4, 5 & 7 used Pierce-Arrow limousine bodies. All were built in Ridgway. It was in 1950, when the railroad lost its mail contract, that #3, #4, #5, and #7 were converted for tourist operations, and RGS adopted the “Galloping Goose” name. That only lasted a year before the RGS folded.